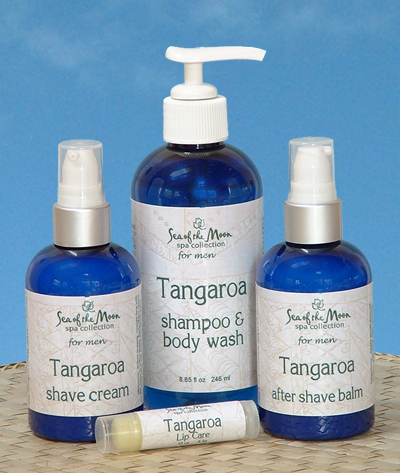 Ancient Polynesian gods and modern skincare technology have joined forces in Wild Woozle Soap Company's new Tangaroa Skincare Collection for Men, an exclusive collection of natural ingredient and aromatherapy-based products specifically designed for men's skincare needs. This unique collection, inspired by traditional ingredients, modern botanical extracts, and the power of an enticing masculine fragrance, was precision formulated to meet the skincare needs of today's men. The great Polynesian god of the sea, Tangaroa, one of the most powerful gods in Maori mythology, was chosen as the symbol of this entirely masculine collection. Shave cream - Add luxury to everyday routine. Soften your beard and skin with the natural nut butters in this rich, non-lathering cream for an exceptionally smooth and comfortable shave. Our precision formulation protects the skin from irritation and razor burn, while the exotic butters, silky smooth glycerin, soothing aloe, and nourishing botanical extracts leave your skin smooth and moisturized. Developed with a select blend of plant extracts, this exclusive shave cream is scented with a proprietary blend of 100% pure essential oils, carefully selected for their therapeutic properties and effectiveness for a variety of skin types. The result is a fresh, masculine fragrance that combines the stimulating scents of fresh ginger and energizing citrus with the magnetism of sandalwood into a discreet, but intriguing blend. After Shave Balm - Soothes and moisturizes, refreshes and regenerates your skin after shaving. Our fresh, soothing aftershave scented with the powerfully masculine fragrance of our signature blend of pure essential oils. This light aftershave balm absorbs quickly to soothe razor burn, redness, and discomfort. Our exclusive formulation uses natural oils, vitamins and natural plant extracts to condition your skin. Our convenient pump bottle easily dispenses just the right amount. Recommended for all skin types to moisturize, rejuvenate and revitalize for healthy skin. 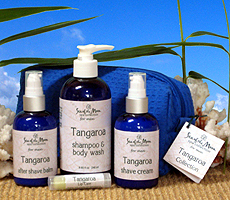 Shampoo & Body Wash - Cleansing, gentle, hydrating, spicy, exotic, and unmistakably masculine. One product to effectively cleanse skin and hair with a delicate lather, leaving skin perfectly clean and hair soft. Our cleansing gel, enriched with wheat protein and awapuhi, Hawaiian White Ginger, leaves skin smooth and nourished. Botanical extracts combine with aromatherapeutic essential oils to cleanse and smooth the skin. Our unique blend is based on the warm spiciness of fresh ginger, combined with the clean, energizing scent of citrus. Cardamom adds an exotic, warm note that blends with sandalwood for depth and sensuality. Lip Balm - Restore and defend. Our lip balm is specifically formulated with pure essential oils to protect, soothe, and repair dry lips. Natural oils and butters moisturize and protect against wind, sun, heat, cold, and environmental damage. The invigorating scent and stimulating taste is an added bonus for you and anyone else with nearby lips. Our unique blend starts with clean, energizing green mandarin. We add warm, spicey ginger and a touch of cardamom for an sensual finish. Apply generously over lips as often as needed. Find more lip balms here. The great Polynesian god of the sea, Tangaroa, is one of the most powerful gods in Maori mythology and plays a central role in creation stories across the Pacific. A son of the Sky and Earth, the creator Tangaroa is said to have brought fire to the people, protect sea voyagers, and control the tides.